• Always have an adult supervise fireworks activities. Parents don’t realize that young children suffer injuries from sparklers. Sparklers burn at temperatures of about 2,000 degrees – hot enough to melt some metals. • Wear long sleeves and long pants; use eye protection. • Use light thermal gloves like what you use for the grill. • Never light fireworks while under the influence. • Never place any part of your body directly over a fireworks device when lighting the fuse. • Back up to a safe distance immediately after lighting fireworks. 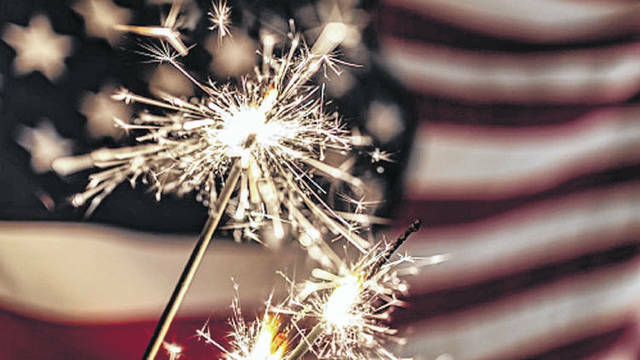 Although consumer fireworks are legal in Kentucky and West Virginia, only sparklers and/or other novelties are allowed in the state of Ohio.